To try and get a broadband connection right now is a maddening game of cat and mouse. If you’re in a regional or rural area, you can be guaranteed a run-around of epic proportions, with each service provider wanting money upfront and two weeks to suss out your address and the situation underground, just to come back and tell you “sorry, you have insufficient broadband infrastructure” or some other inscrutable connection. What does it all mean, and why should you have to know all of this? For the purposes of this gude, we are only looking at ADSL2+, a broadband technology that seeks to connect you to the internet via the means of a standard copper telephone line from your home. Mobile Broadband (‘the little USB stick’) is more straightforward, but is more expensive for the value you get. Cable Broadband is available to 30% of properties, strictly limited to metro areas, and even then isn’t available at many units, apartments and new developments. ADSL2+ is the most widespread form of connection that ticks the most boxes for the most people. Warning: the topic is complex, so the article is long. But it will answer most of your questions. Call us on 1300 106 571 for help in narrowing down your options to find the best provider available to you. 1. Do Telstra own a monopoly? Short answer yes. Your internet connection doesn’t happen magically. Your phone line connects under the ground to a pillar, the pillar is cabled to an exchange, the exchange is cabled to a head office, and the head office is connected to undersea cables. So let’s move backwards. There are about 20 undersea cables connecting Australia to the rest of the world. No monopoly there. Telstra, TPG, Optus and Eftel all own parts of these links. Plenty of competition. Then the exchanges. There are about 2000 of them around Australia. Here, Telstra has a partial monopoly. They own the exchange buildings, and the underground ducts and tunnels that they all connect back to. But there is some competition. Optus, TPG, iiNet, Internode, iPrimus, Netspace, Eftel, Westnet and Adam Internet all have their own Inter-Exchange-Network (IEN). They run their own fibre-optic links in Telstra’s tunnels, which run all the way back to their own head offices. Telstra has placed a connection to the internet at each of these exchanges, as part of an agreement with the Howard government. This was easier for Telstra to do; they owned the buildings, the connections and everything else. But for the competitors, they have to make a business case to wire up their network to each exchange. And it only makes sense if that exchange area connects to a decent number of households. As a result, the really big competitors are Optus, iiNet, Internode and TPG. They run to about 400 exchanges each. iPrimus goes to about 200. Eftel to about 70. And all the others, even less. In the other 1600 exchange areas, Telstra has a monopoly out of the exchange. Other service providers can buy access, but this is more expensive than what’s offered at exchanges that connect to their own network. But where Telstra own a very real, no-question-about-it monopoly is in the connection to each household from each exchange. This is known as the “Last Mile Network”, also known as the copper-access-network (CAN). This is a monopoly in the very real sense that no-one can compete with it. There are 12 million or so connections to each premises, business, apartment, unit, lean-to and igloo in Australia. This network is very large and complex, and is essentially a natural monopoly. To have several tunnels and several leads into each house would be a bit chaotic. Telstra paid a LOT of money to buy this network from Telecom, the government entity that built and owned this network. So they own it fair and square. You could argue about the merits of letting a private company own a public utility, but that’s beside the point. So to summarize – Telstra owns the first part of your connection, to the telephone exchange, no matter where you live. You pay them through the ‘line rental’ part of your bundle package. In metro areas, there’s plenty of low-cost alternative to take your connection from the exchange and out to the internet. In regional and rural areas, Telstra often owns a full monopoly of the connection to, and from the exchange. You still have the option of taking a plan from another provider, but these connections are still being provided by Telstra – so the price will be set by Telstra’s wholesale price. 2. Why do I need to pay line rental for a phone I don’t use? As per above – the line rental doesn’t actually pay for the phone. It pays for the connection along Telstra’s network to the local exchange. You’re provided with a phone service because Telstra are obliged to provide a phone service as part of their Universal Service Obligation. You don’t have to USE the phone service – and if you have a good mobile plan, why would you? Paying line rental is seen by many as paying for a service you don’t want and won’t use. That’s nonsense. You pay line rental to rent the line. That’s it. The phone service is an add-on that you can decide to use on its own merits. 3. What if I get Naked DSL, or Naked Broadband? Then I won’t pay line rental! This is a really tricky one. A copper line is currently configured to carry two different services, at different electronic frequencies – phone and internet. A Naked DSL line is configured to carry just the one service- broadband – and so the speed will improve a little, and there will be less electronic ‘crosstalk’. It is mostly a technological, not economic distinction. As a matter of fact, Naked DSL is usually more expensive than a phone line rental + internet bundle. Due to certain quirks of legislation, the ‘line rental’ doesn’t have to be specified in the pricing for Naked DSL, even though your service provider is still paying Telstra for use of the line. So while it’s technically true that you “Don’t Pay Line Rental”, it’s also the case that you are putting out the same amount of money. The best example is TPG’s Unlimited data plan – in a bundle, it’s $30 plus a $30 line rental. The Naked DSL equivalent is just $70. In other words- never mind the advertising. Consider what your needs are – do you need a fast internet connection as quickly as possible for the best price, and you don’t need a phone service? Then get a bundle and don’t plug in a phone. Naked DSL conveys no economic benefit, and the slight speed benefit isn’t going to be worth the extra hassle and limited options (not every service provider will do Naked DSL). Very Important – Don’t let emotions guide your purchase. Mobile Broadband is far more expensive per megabyte, and in most cases is far less reliable – but it also has ‘no line rental’. Consider everything before making a purchase! 4. I don’t even have a telephone line! Telephone line-in connections are a public utility. Unless the house is very new, you’ll have one. They look like this. Just because you’ve never had it activated, doesn’t mean it isn’t connected to something. If you’re renting, and there’s no telephone jack like this, then call your real estate agent/landlord. If you’ve moved into a new house that you’ve purchased, try to connect and get told you’ll need to pay $299, then it’s likely that the line only goes to the Telstra connection point at the end of your property. You would need to pay $299 for Telstra to find you a connection back to the exchange. 5. Why does it take two weeks to connect me? Mainly because there’s a queue. A connection isn’t just a switch that’s turned on and off. If your line is vacant (no services currently active) then you can bet that it’s not plugged in anywhere. 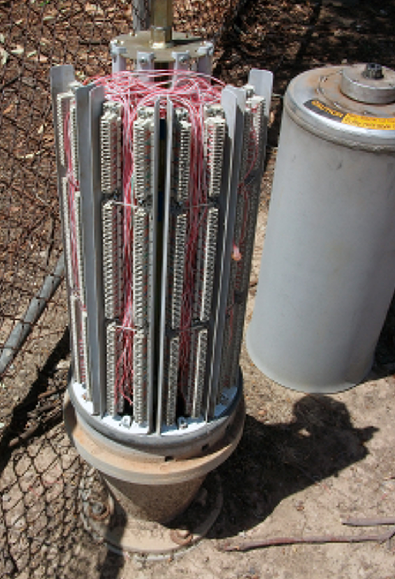 When the former tenant, or you yourself elected to disconnect your line, it was disconnected inside the grey Telstra pillar on your street. That freed up a connection for someone else. Your line needs to be reconnected to a termination point inside the pillar, and to mains power in the pit. That takes a visit from a Telstra technician, and you have to wait in line for that. Ever seen a technician sitting in front of an open pillar? He or she is trying to find a spare pair (‘Pair’ is the shorthand for a line back to the exchange, as each line is made up of a twisted pair of copper wires). Once that’s done, a TPG/iiNet/Dodo/Whatever techie gets an order to visit the exchange building. They go in, find the lead corresponding to your home, and run a connection from that point to their big mainframe connecting back to their underground fibre network. This mainframe is called a Digital Subscriber Line Access Multiplexer (DSLAM, or Dee-Slam!). Then you’ll be connected. Note: None of this is easy. YOU try to find the right cable. 6. I tried to connect, and was told I’m on a Pair Gains System or RIM. Pair Gains is a general term for tricks that Telstra can use to gain ‘pairs’, unsurprisingly. When a new area was built in the past, Telecom would run new cable from the exchange to the new area to meet demand, with a bit of redundancy. If 200 new homes were being built, they’d run out about 300 lines. Over time, those lines get used up. Some fail and get decommissioned. Some homes turn into units, so now there’s 10 more addresses to connect. So instead of running out new copper to that area (expenso!) they will pair-gain by using a few technologies. The most common by far is to install a Remote Integrated Multiplexer (RIM) or Customer Multiplexer (CMUX). This is where Telstra have run a fibre optic lead to a streetside cabinet, and then run short runs of copper from there. This is very common in new developments in remote locations, where the exchange is often more than 4 km from that site. A RIM/CMUX isn’t necessarily a bad thing. It co-locates the exchange, for all intents and purposes. But because a cabinet isn’t big enough to hold a DSLAM from another provider, you’re out of luck to connect to one of those cheaper alternatives to Telstra. Most RIMs and CMUX also don’t support the faster ADSL2+ standard. The equipment used will provide ADSL 1, which is about a third the speed. That’s not necessarily a bad thing. ADSL2+ is 24 megabits-per-second (Mbps) at the exchange. But if you’re far away from the exchange, this will slow down to 1.5Mbps by the time it reaches your house. ADSL 1 is only 8Mbps from its output point. But if that’s a RIM or CMUX just 200 metres down the road, then you’re laughing! But you’ll be paying more, because this is a Telstra Wholesale line. Also, Telstra has begun rolling out a ‘Top-Hat Upgrade” to nearly 2000 RIMs. This will put ADSL2+ equipment into these cabinets, so your connection will be even faster. How other providers will be able to compete for your business is still being worked out. 7. I tried to connect but was told I’m too far from the exchange, or had insufficient copper infrastructure. That’s no good. You may be $h!t Out Of Luck. Before this year, Telstra MIGHT have put in a RIM or some other solution; now they won’t do anything, because their days are numbered thanks to the NBN. The National Broadband Network is a government initiative to replace this aging copper network with fibre optic cables right up to everyone’s door. Apart from greatly increasing the available speeds, this will also ensure that every address will get the exact same offerings, regardless of remote location (some 7% will get wireless and satellite options that still beat current existing versions of those technologies). Your speed won’t depend on how far you are from an exchange. You pay for what you get, with which ever service provider you want. This will replace Telstra’s monopolies. Telstra will need to rely more on their customer service than on their infrastructure monopoly. They can still compete on infrastructure in mobile, where they have the largest network of towers – but their network has no bearing on the competition from Vodafone and Optus. But this is why, in a nutshell, Telstra is moving so fast to make their mobile network so good. They want to compete with the NBN with the best wireless alternative. The NBN is planned as a wholesaler only. Because fibre can carry much more data, at higher speeds over longer distances there won’t be a need for 2000 exchanges. Instead there will be 121 Points-of-Interconnect (POIs) servicing about 80,000 – 100,000 homes each. Each service provider has to buy access to every one of those POIs (which is hugely cheaper than building their own networks). There is a worry that there will be no infrastructure competition at all; but realistically, there isn’t very much now. The NBN will take up to ten years to build, and may get derailed along the way. The coalition have pledged to replace it with a Fibre-to-the-Node network. This would run fibre to a point servicing several hundred homes, and then use Telstra’s copper to make the last bit of the connection. This is much cheaper, but it still retains Telstra’s monopoly on the last mile. In fact, it just brings the ‘last mile’ much closer. It’s a RIM rollout for the whole country. Putting aside which option is better or worse, even the coalition alternative would take 5 or 6 years to complete. But if you’ve ever felt that the whole world is against you when trying to get a decent broadband connection, at least take heart that you’re not alone, and change is coming one way or another.